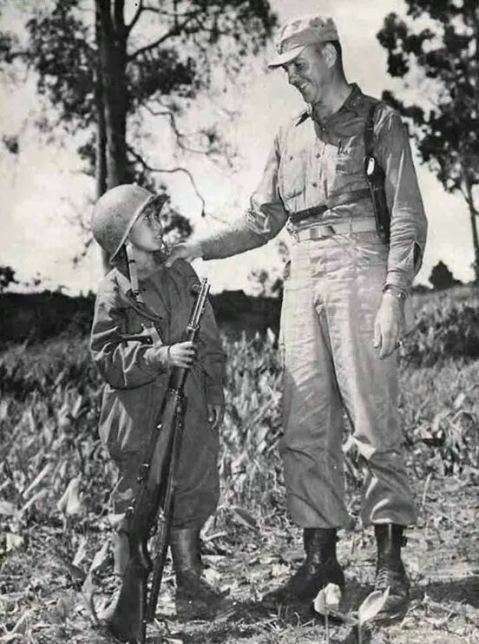 13-yr old Adone Santiago, believed to be the youngest soldier in Philippine Army uniform, talks with Lt. Col. Robert W. King, to whose 38th Infantry Division battalion the boy’s unit is attached. Adone is credited with having killed 7 Japanese soldiers (1 as a guerrilla and 6 as a Philippine Army soldier). His superior officers say he insists on going in every patrol…1945. This is Adone Santiago’s story as recounted in the Altoona Tribune, 6 August 1945. By: JAMES HUTCHESON, WITH THE 3STH DIVISION ON LUZON, Philippines , Aug. 5 1945. Adone Santiago is probably the only soldier in the Philippines who ever cried because he couldn’t go hunting Japanese in the mountains. He cried like the small boy that he is. Private Santiago of the Philippine Commonwealth Army is only 13 years old. He looks like a toy soldier in the flesh. The concussion of a mortar blast might blow- all 65 pounds of him away. But little Adone’s military prowess is a thing to command respect. The Filipino major commanding his unit says Adone’s comrades have confirmed his claim to having killed seven Japs, one during two years as a guerrilla and six since the guerrilla units have been absorbed into the army organization. Adone looks more like a mascot than a member of the team. He is equipped with regular uniform, slightly oversize. G. I. clothing wasn’t made for 13 year olds. His steel helmet hangs around his head like an oversize sun bonnet. His combat boots, which are half again his size, just about reach to his knees or where his knees should be. All you can do is guess where his knees are in the drooping folds of those breeches. Private Adone has a deep-rooted hatred of the Japanese. In faltering monosyllabic English, he tells how Japanese killed both his mother and father in their Manila home early in the war. An only child, Adone said he was playing under the house when Japanese soldiers entered. “I see through floor.” he related, gesticulating and big, boyish eyes rolling. “Japs try take my mother. My father fight them. Japs bayonet my father, my mother.” Adone says he later hiked with two older boys to Bataan and tagged along with guerrillas, living in the open. Now he is in a Filipino unit attached to the battalion of Lt. Col. Robert W. King of Terre Haute, Ind., and wants to continue an army career. “I like to go patrols after Japs.” he said. A carbine is his weapon. Wenceslao Q. Vinzons, Statesman, Patriot and Martyr.